Barman (Backup and Recovery Manager) is an open-source administration tool for disaster recovery of PostgreSQL servers written in Python. It allows your organisation to perform remote backups of multiple servers in business critical environments to reduce risk and help DBAs during the recovery phase. Barman is distributed under GNU GPL 3 and maintained by 2ndQuadrant, a platinum sponsor of the PostgreSQL project. IMPORTANT: This manual assumes that you are familiar with theoretical disaster recovery concepts, and that you have a grasp of PostgreSQL fundamentals in terms of physical backup and disaster recovery. See section “Before you start” below for details. In such cases, any ICT manager or DBA should be able to fix the incident and recover the database in the shortest time possible. We normally refer to this discipline as disaster recovery, and more broadly business continuity. In a few words, RPO represents the maximum amount of data you can afford to lose, while RTO represents the maximum down-time you can afford for your service. Understandably, we all want RPO=0 (“zero data loss”) and RTO=0 (zero down-time, utopia) - even if it is our grandmothers’s recipe website. In reality, a careful cost analysis phase allows you to determine your business continuity requirements. Fortunately, with an open source stack composed of Barman and PostgreSQL, you can achieve RPO=0 thanks to synchronous streaming replication. RTO is more the focus of a High Availability solution, like repmgr. Therefore, by integrating Barman and repmgr, you can dramatically reduce RTO to nearly zero. Based on our experience at 2ndQuadrant, we can confirm that PostgreSQL open source clusters with Barman and repmgr can easily achieve more than 99.99% uptime over a year, if properly configured and monitored. In any case, it is important for us to emphasise more on cultural aspects related to disaster recovery, rather than the actual tools. Tools without human beings are useless. It is going to be a Friday evening, most likely right when you are about to leave the office. It is going to be when you are on holiday (right in the middle of your cruise around the world) and somebody else has to deal with it. It is certainly going to be stressful. You will regret not being sure that the last available backup is valid. Unless you know how long it approximately takes to recover, every second will seems like forever. Be prepared, don’t be scared. In 2011, with these goals in mind, 2ndQuadrant started the development of Barman, now one of the most used backup tools for PostgreSQL. Barman is an acronym for “Backup and Recovery Manager”. Currently, Barman works only on Linux and Unix operating systems. Before you start using Barman, it is fundamental that you get familiar with PostgreSQL and the concepts around physical backups, Point-In-Time-Recovery and replication, such as base backups, WAL archiving, etc. Professional training on these topics is another effective way of learning these concepts. At any time of the year you can find many courses available all over the world, delivered by PostgreSQL companies such as 2ndQuadrant. One of the foundations of Barman is the ability to operate remotely from the database server, via the network. Theoretically, you could have your Barman server located in a data centre in another part of the world, thousands of miles away from your PostgreSQL server. Realistically, you do not want your Barman server to be too far from your PostgreSQL server, so that both backup and recovery times are kept under control. Having said this, a very common setup for Barman is to be installed in the same data centre where your PostgreSQL servers are. In this case, the single point of failure is the data centre. Fortunately, the impact of such a SPOF can be alleviated thanks to a feature called hook scripts. Indeed, backups of Barman can be exported on different media, such as tape via tar, or locations, like an S3 bucket in the Amazon cloud. Remember that no decision is forever. You can start this way and adapt over time to the solution that suits you best. However, try and keep it simple to start with. As a result, you can model complex disaster recovery architectures, forming a “star schema”, where PostgreSQL servers rotate around a central Barman server. Every architecture makes sense in its own way. Choose the one that resonates with you, and most importantly, the one you trust, based on real experimentation and testing. Choosing one of these two methods is a decision you will need to make. On a general basis, starting from Barman 2.0, backup over streaming replication is the recommended setup for PostgreSQL 9.4 or higher. Moreover, if you do not make use of tablespaces, backup over streaming can be used starting from PostgreSQL 9.2. IMPORTANT: Because Barman transparently makes use of pg_basebackup, features such as incremental backup, parallel backup, deduplication, and network compression are currently not available. In this case, bandwidth limitation has some restrictions - compared to the traditional method via rsync. Traditional backup via rsync/SSH is available for all versions of PostgreSQL starting from 8.3, and it is recommended in all cases where pg_basebackup limitations occur (for example, a very large database that can benefit from incremental backup and deduplication). The reason why we recommend streaming backup is that, based on our experience, it is easier to setup than the traditional one. Also, streaming backup allows you to backup a PostgreSQL server on Windows5, and makes life easier when working with Docker. PostgreSQL’s Point-In-Time-Recovery requires that transactional logs, also known as xlog or WAL files, are stored alongside of base backups. Traditionally, Barman has supported standard WAL file shipping through PostgreSQL’s archive_command (usually via rsync/SSH). With this method, WAL files are archived only when PostgreSQL switches to a new WAL file. To keep it simple, this normally happens every 16MB worth of data changes. 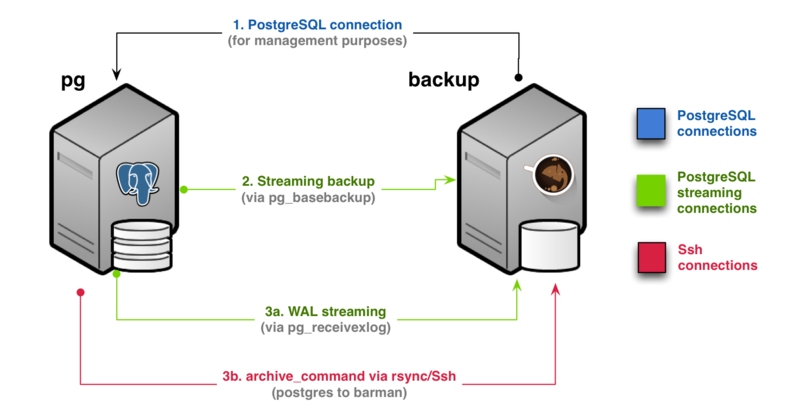 Barman 1.6.0 introduces streaming of WAL files for PostgreSQL servers 9.2 or higher, as an additional method for transactional log archiving, through pg_receivexlog. WAL streaming is able to reduce the risk of data loss, bringing RPO down to near zero values. Barman 2.0 introduces support for replication slots with PostgreSQL servers 9.4 or above, therefore allowing WAL streaming-only configurations. Moreover, you can now add Barman as a synchronous WAL receiver in your PostgreSQL 9.5 (or higher) cluster, and achieve zero data loss (RPO=0). In some cases you have no choice and you are forced to use traditional archiving. In others, you can choose whether to use both or just WAL streaming. Unless you have strong reasons not to do it, we recommend to use both channels, for maximum reliability and robustness. In order to make life easier for you, below we summarise the two most typical scenarios for a given PostgreSQL server in Barman. Bear in mind that this is a decision that you must make for every single server that you decide to back up with Barman. This means that you can have heterogeneous setups within the same installation. As mentioned before, we will only worry about the PostgreSQL server (pg) and the Barman server (backup). However, in real life, your architecture will most likely contain other technologies such as repmgr, pgBouncer, Nagios/Icinga, and so on. If you are using PostgreSQL 9.4 or higher, and your database falls under a general use case scenario, you will likely end up deciding on a streaming backup installation - see figure below. This setup, in Barman’s terminology, is known as streaming-only setup, as it does not require any SSH connection for backup and archiving operations. This is particularly suitable and extremely practical for Docker environments. However, as mentioned before, you can configure standard archiving as well and implement a more robust architecture - see figure below. This architecture is available also to PostgreSQL 9.2/9.3 users that do not use tablespaces. Starting from PostgreSQL 9.2, you can add a streaming replication connection that is used for WAL streaming and significantly reduce RPO. This more robust implementation is depicted in figure . IMPORTANT: Users of RedHat Enterprise Linux, CentOS and Scientific Linux are required to install the Extra Packages Enterprise Linux (EPEL) repository. NOTE: Python 3 support is experimental. Report any bug through the ticketing system on Github or the mailing list. The most critical requirement for a Barman server is the amount of disk space available. You are recommended to plan the required disk space based on the size of the cluster, number of WAL files generated per day, frequency of backups, and retention policies. Although the only file systems that we officially support are XFS and Ext4, we are aware of users that deploy Barman on different file systems including ZFS and NFS. Barman allows you to recover a PostgreSQL instance either locally (where Barman resides) or remotely (on a separate server). Remote recovery is definitely the most common way to restore a PostgreSQL server with Barman. In general, it is highly recommended to create recovery environments that are as similar as possible, if not identical, to the original server, because they are easier to maintain. For example, we suggest that you use the same operating system, the same PostgreSQL version, the same disk layouts, and so on. Additionally, dedicated recovery environments for each PostgreSQL server, even on demand, allows you to nurture the disaster recovery culture in your team. You can be prepared for when something unexpected happens by practising recovery operations and becoming familiar with them. Based on our experience, designated recovery environments reduce the impact of stress in real failure situations, and therefore increase the effectiveness of recovery operations. Finally, it is important that time is synchronised between the servers, using NTP for example. IMPORTANT: The recommended way to install Barman is by using the available packages for your GNU/Linux distribution. Barman can be installed on RHEL7, RHEL6 and RHEL5 Linux systems using RPM packages. It is required to install the Extra Packages Enterprise Linux (EPEL) repository beforehand. RPM packages for Barman are available via Yum through the PostgreSQL Global Development Group RPM repository. You need to follow the instructions for your distribution (for example RedHat, CentOS, or Fedora) and architecture as detailed at yum.postgresql.org. 2ndQuadrant also maintains RPM packages for Barman and distributes them through Sourceforge.net. Barman can be installed on Debian and Ubuntu Linux systems using packages. It is directly available in the official repository for Debian and Ubuntu, however, these repositories might not contain the latest available version. If you want to have the latest version of Barman, the recommended method is to install it through the PostgreSQL Community APT repository. Instructions can be found in the APT section of the PostgreSQL Wiki. NOTE: Thanks to the direct involvement of Barman developers in the PostgreSQL Community APT repository project, you will always have access to the most updated versions of Barman. WARNING: Manual installation of Barman from sources should only be performed by expert GNU/Linux users. Installing Barman this way requires system administration activities such as dependencies management, barman user creation, configuration of the barman.conf file, cron setup for the barman cron command, log management, and so on. Create a system user called barman on the backup server. As barman user, download the sources and uncompress them. The barman application will be installed in your user directory (make sure that your PATH environment variable is set properly). Barman is also available on the Python Package Index (PyPI) and can be installed through pip. Version 2.0 requires that users explicitly configure their archiving strategy. Before, the file based archiver, controlled by archiver, was enabled by default. Additionally, for a few releases, Barman will transparently set archiver = on with any server that has not explicitly set an archiving strategy and emit a warning. Besides that, version 2.0 is fully compatible with older ones. The main configuration file (set to /etc/barman.conf by default) contains general options such as main directory, system user, log file, and so on. Server configuration files, one for each server to be backed up by Barman, are located in the /etc/barman.d directory and must have a .conf suffix. IMPORTANT: For historical reasons, you can still have one single configuration file containing both global and server options. However, for maintenance reasons, this approach is deprecated. Configuration files in Barman follow the INI format. boolean, on/true/1 are accepted as well are off/false/0. None of them requires to be quoted. NOTE: some enum allows off but not false. Barman implements the convention over configuration design paradigm, which attempts to reduce the number of options that you are required to configure without losing flexibility. Therefore, some server options can be defined at global level and overridden at server level, allowing users to specify a generic behavior and refine it for one or more servers. These options have a global/server scope. For a list of all the available configurations and their scope, please refer to section 5 of the ‘man’ page. description =  "Example of PostgreSQL Database (Streaming-Only)"
description =  "Example of PostgreSQL Database (via Ssh)"
For more detailed information, please refer to the distributed barman.conf file, as well as the ssh-server.conf-template and streaming-server.conf-template template files. This section contains some preliminary steps that you need to undertake before setting up your PostgreSQL server in Barman. IMPORTANT: Before you proceed, it is important that you have made your decision in terms of WAL archiving and backup strategies, as outlined in the “Design and architecture” section. In particular, you should decide which WAL archiving methods to use, as well as the backup method. You need to make sure that the backup server can connect to the PostgreSQL server on pg as superuser. This operation is mandatory. IMPORTANT: The above command will prompt for a password, which you are then advised to add to the ~barman/.pgpass file on the backup server. For further information, please refer to “The Password File” section in the PostgreSQL Documentation. This connection is required by Barman in order to coordinate its activities with the server, as well as for monitoring purposes. You can choose your favourite client authentication method among those offered by PostgreSQL. More information can be found in the “Client Authentication” section of the PostgreSQL Documentation. NOTE: Barman honours the application_name connection option for PostgreSQL servers 9.0 or higher. One configuration parameter that is crucially important is the wal_level parameter. This parameter must be configured to ensure that all the useful information necessary for a backup to be coherent are included in the transaction log file. For PostgreSQL versions older than 9.6, wal_level must be set to hot_standby. Restart the PostgreSQL server for the configuration to be refreshed. IMPORTANT: Please make sure you are able to connect via streaming replication before going any further. This option represents the maximum number of concurrent streaming connections that the server will be allowed to manage. The values proposed for max_replication_slots and max_wal_senders must be considered as examples, and the values you will use in your actual setup must be choosen after a careful evaluation of the architecture. Please consult the PostgreSQL documentation for guidelines and clarifications. SSH is a protocol and a set of tools that allows you to open a remote shell to a remote server and copy files between the server and the local system. You can find more documentation about SSH usage in the article “SSH Essentials” by Digital Ocean. SSH key exchange is a very common practice that is used to implement secure passwordless connections between users on different machines, and it’s needed to use rsync for WAL archiving and for backups. NOTE: This procedure is not needed if you plan to use the streaming connection only to archive transaction logs and backup your PostgreSQL server. As this key must be used to connect from hosts without providing a password, no passphrase should be entered during the key pair creation. For the same reason, no passphrase should be entered. The SSH connection from the PostgreSQL server to the backup server is needed to correctly archive WAL files using the archive_command setting. To successfully connect from the PostgreSQL server to the backup server, the PostgreSQL public key has to be configured into the authorized keys of the backup server for the barman user. The public key to be authorized is stored inside the postgres user home directory in a file named .ssh/id_rsa.pub, and its content should be included in a file named .ssh/authorized_keys inside the home directory of the barman user in the backup server. If the authorized_keys file doesn’t exist, create it using 600 as permissions. The value of the archive_command configuration parameter will be discussed in the “WAL archiving via archive_command section”. The SSH connection between the backup server and the PostgreSQL server is used for the traditional backup over rsync. Just as with the connection from the PostgreSQL server to the backup server, we should authorize the public key of the backup server in the PostgreSQL server for the postgres user. The content of the file .ssh/id_rsa.pub in the barman server should be put in the file named .ssh/authorized_keys in the PostgreSQL server. The permissions of that file should be 600. The following command should succeed without any output if the key pair exchange has been completed successfully. description =  "Our main PostgreSQL server"
The conninfo option is set accordingly to the section “Preliminary steps: PostgreSQL connection”. The meaning of the backup_method option will be covered in the backup section of this guide. This value must be choosen accordingly as described in the section “Preliminary steps: PostgreSQL connection”. Barman relies on pg_receivexlog, a utility that has been available from PostgreSQL 9.2 which exploits the native streaming replication protocol and continuously receives transaction logs from a PostgreSQL server (master or standby). IMPORTANT: Barman requires that pg_receivexlog is installed on the same server. For PostgreSQL 9.2 servers, you need pg_receivexlog of version 9.2 installed alongside Barman. For PostgreSQL 9.3 and above, it is recommended to install the latest available version of pg_receivexlog, as it is back compatible. Otherwise, users can install multiple versions of pg_receivexlog on the Barman server and properly point to the specific version for a server, using the path_prefix option in the configuration file. The cron command, if the aforementioned requirements are met, transparently manages log streaming through the execution of the receive-wal command. This is the recommended scenario. NOTE: The receive-wal command is a foreground process. Transaction logs are streamed directly in the directory specified by the streaming_wals_directory configuration option and are then archived by the archive-wal command. Unless otherwise specified in the streaming_archiver_name parameter, and only for PostgreSQL 9.3 or above, Barman will set application_name of the WAL streamer process to barman_receive_wal, allowing you to monitor its status in the pg_stat_replication system view of the PostgreSQL server. Replication slots are an automated way to ensure that the PostgreSQL server will not remove WAL files until they were received by all archivers. Barman uses this mechanism to receive the transaction logs from PostgreSQL. You can find more information about replication slots in the PostgreSQL manual. You can even base your backup architecture on streaming connection only. This scenario is useful to configure Docker-based PostgreSQL servers and even to work with PostgreSQL servers running on Windows. IMPORTANT: In this moment, the Windows support is still experimental, as it is not yet part of our continuous integration system. First, the PostgreSQL server must be configured to stream the transaction log files to the Barman server. This option defines the name of the replication slot that will be used by Barman. It is mandatory if you want to use replication slots. The archive_command is the traditional method to archive WAL files. The value of this PostgreSQL configuration parameter must be a shell command to be executed by the PostgreSQL server to copy the WAL files to the Barman incoming directory. IMPORTANT: PostgreSQL 9.5 introduced support for WAL file archiving using archive_command from a standby. This feature is not yet implemented in Barman. Make sure you change the INCOMING_WALS_DIRECTORY placeholder with the value returned by the barman show-server pg command above. In order to test that continuous archiving is on and properly working, you need to check both the PostgreSQL server and the backup server. In particular, you need to check that WAL files are correctly collected in the destination directory. The above command will force PostgreSQL to switch WAL file and trigger the archiving process in Barman. Barman will wait for one file to arrive within 30 seconds (you can change the timeout through the --archive-timeout option). If no WAL file is received, an error is returned. You can verify if the WAL archiving has been correctly configured using the barman check command. Barman can backup a PostgreSQL server using the streaming connection, relying on pg_basebackup, a utility that has been available from PostgreSQL 9.1. IMPORTANT: Barman requires that pg_basebackup is installed in the same server. For PostgreSQL 9.2 servers, you need the pg_basebackup of version 9.2 installed alongside with Barman. For PostgreSQL 9.3 and above, it is recommented to install the last available version of pg_basebackup, as it is back compatible. You can even install multiple versions of pg_basebackup on the Barman server and properly point to the specific version for a server, using the path_prefix option in the configuration file. IMPORTANT: keep in mind that if the WAL archiving is not currently configured, you will not be able to start a backup. IMPORTANT: pg_basebackup 9.4 or higher is required for tablespace support if you use the postgres backup method. The backup over rsync was the only available method before 2.0, and is currently the only backup method that supports the incremental backup feature. Please consult the “Features in detail” section for more information. The backup_method option activates the rsync backup method, and the ssh_command option is needed to correctly create an SSH connection from the Barman server to the PostgreSQL server. You can backup a PostgreSQL server running on Windows using the streaming connection for both WAL archiving and for backups. IMPORTANT: This feature is still experimental because it is not yet part of our continuous integration system. Follow every step discussed previously for a streaming connection setup. This has been reported to fix the issue. You can backup your server as usual. Remote recovery is not supported for Windows servers, so you must recover your cluster locally in the Barman server and then copy all the files on a Windows server or use a folder shared between the PostgreSQL server and the Barman server. Additionally, make sure that the system user chosen to run PostgreSQL has the permission needed to access the restored data. Basically, it must have full control over the PostgreSQL data directory. Barman has many commands and, for the sake of exposition, we can organize them by scope. The scope of the general commands is the entire Barman server, that can backup many PostgreSQL servers. Server commands, instead, act only on a specified server. Backup commands work on a backup, which is taken from a certain server. The following list includes the general commands. barman doesn’t include a long-running daemon or service file (there’s nothing to systemctl start, service start, etc.). Instead, the barman cron subcommand is provided to perform barman’s background “steady-state” backup operations. NOTE: This command should be executed in a cron script. Our recommendation is to schedule barman cron to run every minute. If you installed Barman using the rpm or debian package, a cron entry running on every minute will be created for you. The cron command ensures that WAL streaming is started for those servers that have requested it, by transparently executing the receive-wal command. You might want to check barman list-server to make sure you get all of your servers. The diagnose command creates a JSON report useful for diagnostic and support purposes. This report contains information for all configured servers. IMPORTANT: Even if the diagnose is written in JSON and that format is thought to be machine readable, its structure is not to be considered part of the interface. Format can change between different Barman versions. As we said in the previous section, server commands work directly on a PostgreSQL server or on its area in Barman, and are useful to check its status, perform maintainance operations, take backups, and manage the WAL archive. The archive_wal command execute maintainance operations on WAL files for a given server. This operations include processing of the WAL files received from the streaming connection or from the archive_command or both. IMPORTANT: The archive_wal command, even if it can be directly invoked, is designed to be started from the cron general command. The backup command takes a full backup (base backup) of a given server. It has several options that let you override the corresponding configuration parameter for the new backup. For more information, consult the manual page. TIP: You can use barman backup all to sequentially backup all your configured servers. TIP: You can use barman check all to check all your configured servers. IMPORTANT: The check command is probably the most critical feature that Barman implements. We recommend to integrate it with your alerting and monitoring infrastructure. The --nagios option allows you to easily create a plugin for Nagios/Icinga. If the requested WAL file is found in the server archive, the uncompressed content will be returned to STDOUT, unless otherwise specified. recovery_options is a global/server option that accepts a list of comma separated values. If the keyword get-wal is present during a recovery operation, Barman will prepare the recovery.conf file by setting the restore_command so that barman get-wal is used to fetch the required WAL files. Similarly, one can use the --get-wal option for the recover command at run-time. Please note that the get-wal command should always be invoked as barman user, and that it requires the correct permission to read the WAL files from the catalog. This is the reason why we are using sudo -u barman in the example. Setting recovery_options to get-wal for a remote recovery will instead generate a restore_command using the barman-wal-restore script. barman-wal-restore is a more resilient shell script which manages SSH connection errors. This script has many useful options such as the automatic compression and decompression of the WAL files and the peek feature, which allows you to retrieve the next WAL files while PostgreSQL is applying one of them. It is an excellent way to optimise the bandwidth usage between PostgreSQL and Barman. barman-wal-restore is available in the barman-cli project or package. Since it uses SSH to communicate with the Barman server, SSH key authentication is required for the postgres user to login as barman on the backup server. IMPORTANT: Even though recovery_options aims to automate the process, using the get-wal facility requires manual intervention and proper testing. TIP: You can request a full list of the backups of all servers using all as the server name. To have a machine-readable output you can use the --minimal option. At any time, you can regenerate the content of the WAL archive for a specific server (or every server, using the all shortcut). The WAL archive is contained in the xlog.db file and every server managed by Barman has its own copy. The xlog.db file can be rebuilt with the rebuild-xlogdb command. This will scan all the archived WAL files and regenerate the metadata for the archive. This command manages the receive-wal process, which uses the streaming protocol to receive WAL files from the PostgreSQL streaming connection. If the command is run without options, a receive-wal process will be started. This command is based on the pg_receivexlog PostgreSQL command. If the command is run with the --stop option, the currently running receive-wal process will be stopped. The receive-wal process uses a status file to track last written record of the transaction log. When the status file needs to be cleaned, the --reset option can be used. IMPORTANT: If you are not using replication slots, you rely on the value of wal_keep_segments. Be aware that under high peeks of workload on the database, the receive-wal process might fall behind and go out of sync. As a precautionary measure, Barman currently requires that users manually execute the command with the --reset option, to avoid making wrong assumptions. The receive-wal process is also useful to create or drop the replication slot needed by Barman for its WAL archiving procedure. With the --create-slot option, the replication slot named after the slot_name configuration option will be created on the PostgreSQL server. With the --drop-slot, the previous replication slot will be deleted. The replication-status command reports the status of any streaming client currently attached to the PostgreSQL server, including the receive-wal process of your Barman server (if configured). TIP: You can request a full status report of the replica for all your servers using all as the server name. TIP: you can request a full configuration report using all as the server name. The status command shows live information and status of a PostgreSQL server or of all servers if you use all as server name. This command makes the PostgreSQL server switch to another transaction log file (WAL), allowing the current log file to be closed, received and then archived. If there has been no transaction activity since the last transaction log file switch, the switch needs to be forced using the --force option. The --archive option requests Barman to trigger WAL archiving after the xlog switch. By default, a 30 seconds timeout is enforced (this can be changed with --archive-timeout). If no WAL file is received, an error is returned. NOTE: In Barman 2.1 and 2.2 this command was called switch-xlog. It has been renamed for naming consistency with PostgreSQL 10 and higher. Backup commands are those that works directly on backups already existing in Barman’s backup catalog. to remove the oldest backup available in the catalog and reclaim disk space. The delete command accepts any shortcut to identify backups. With the --target TARGET_TYPE option, it is possible to choose the content of the list for a given backup. The default value for TARGET_TYPE is standalone. IMPORTANT: The list-files command facilitates interaction with external tools, and can therefore be extremely useful to integrate Barman into your archiving procedures. The recover command is used to recover a whole server after a backup is executed using the backup command. At the end of the execution of the recovery, the selected backup is recovered locally and the destination path contains a data directory ready to be used to start a PostgreSQL instance. IMPORTANT: Running this command as user barman, it will become the database superuser. The specific ID of a backup can be retrieved using the list-backup command. IMPORTANT: Barman does not currently keep track of symbolic links inside PGDATA (except for tablespaces inside pg_tblspc). We encourage system administrators to keep track of symbolic links and to add them to the disaster recovery plans/procedures in case they need to be restored in their original location. The recovery command has several options that modify the command behavior. Add the --remote-ssh-command <COMMAND> option to the invocation of the recovery command. Doing this will allow Barman to execute the copy on a remote server, using the provided command to connect to the remote host. NOTE: It is advisable to use the postgres user to perform the recovery on the remote host. Barman requires at least 4GB of free space in the system temporary directory unless the get-wal command is specified in the recovery_option parameter in the Barman configuration. The remote user must be able to create the directory structure of the backup in the destination directory. There must be enough free space on the remote server to contain the base backup and the WAL files needed for recovery. If the destination directory does not exists, Barman will try to create it (assuming you have the required permissions). Barman wraps PostgreSQL’s Point-in-Time Recovery (PITR), allowing you to specify a recovery target, either as a timestamp, as a restore label, or as a transaction ID. IMPORTANT: The earliest PITR for a given backup is the end of the base backup itself. If you want to recover at any point in time between the start and the end of a backup, you must use the previous backup. From Barman 2.3 you can exit recovery when consistency is reached by using --target-immediate option (available only for PostgreSQL 9.4 and newer). IMPORTANT: Recovery target via time and xid must be subsequent to the end of the backup. If you want to recover to a point in time between the start and the end of a backup, you must recover from the previous backup in the catalogue. You can use the --exclusive option to specify whether to stop immediately before or immediately after the recovery target. Barman allows you to specify a target timeline for recovery, using the target-tli option. The notion of timeline goes beyond the scope of this document; you can find more details in the PostgreSQL documentation, as mentioned in the “Before you start” section. The show-backup command accepts any shortcut to identify backups. In this section we present several Barman features and discuss their applicability and the configuration required to use them. This list is not exhaustive, as many scenarios can be created working on the Barman configuration. Nevertheless, it is useful to discuss common patterns. Barman implements file-level incremental backup. Incremental backup is a type of full periodic backup which only saves data changes from the latest full backup available in the catalog for a specific PostgreSQL server. It must not be confused with differential backup, which is implemented by WAL continuous archiving. NOTE: Block level incremental backup will be available in future versions. IMPORTANT: The reuse_backup option can’t be used with the postgres backup method at this time. This feature heavily relies on rsync and hard links, which must therefore be supported by both the underlying operating system and the file system where the backup data resides. The main concept is that a subsequent base backup will share those files that have not changed since the previous backup, leading to relevant savings in disk usage. This is particularly true of VLDB contexts and of those databases containing a high percentage of read-only historical tables. Setting this at global level will automatically enable incremental backup for all your servers. It is possible to limit the usage of I/O bandwidth through the bandwidth_limit option (global/per server), by specifying the maximum number of kilobytes per second. By default it is set to 0, meaning no limit. The option accepts a comma separated list of pairs made up of the tablespace name and the bandwidth limit (in kilobytes per second). When backing up a server, Barman will try and locate any existing tablespace in the above option. If found, the specified bandwidth limit will be enforced. If not, the default bandwidth limit for that server will be applied. IMPORTANT: the network_compression option is not available with the postgres backup method. Setting this option to true will enable data compression during network transfers (for both backup and recovery). By default it is set to false. Normally, during backup operations, Barman uses PostgreSQL native functions pg_start_backup and pg_stop_backup for exclusive backup. These operations are not allowed on a read-only standby server. This introduces a new architecture scenario with Barman: backup from a standby server, using rsync. IMPORTANT: Concurrent backup requires users of PostgreSQL 9.2, 9.3, 9.4, and 9.5 to install the pgespresso open source extension on every PostgreSQL server of the cluster. For more detailed information and the source code, please visit the pgespresso extension website. Barman supports the new API introduced in PostgreSQL 9.6. This removes the requirement of the pgespresso extension to perform concurrent backups from this version of PostgreSQL. By default, backup_options is transparently set to exclusive_backup for back compatibility reasons. Users of PostgreSQL 9.6 should set backup_options to concurrent_backup. conninfo must point to a database on the destination Postgres database. Using PostgreSQL 9.2, 9.3, 9.4, and 9.5, pgespresso must be correctly installed through CREATE EXTENSION. Using 9.6 or greater, concurrent backups are executed through the Postgres native API. The destination Postgres server can be either the master or a streaming replicated standby server. NOTE: When backing up from a standby server, continuous archiving of WAL files must be configured on the master to ship files to the Barman server (as outlined in the “WAL archiving via archive_command” section above)10. NOTE: All methods but pybzip2 and pygzip require barman archive-wal to fork a new process. IMPORTANT: This feature is available only from PostgreSQL 9.5 and above. Barman can also reduce the Recovery Point Objective to zero, by collecting the transaction WAL files like a synchronous standby server would. 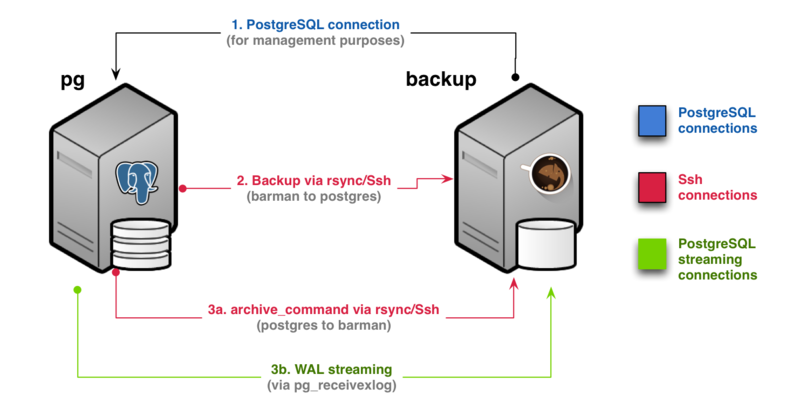 To configure such a scenario, the Barman server must be configured to archive WALs via the streaming connection, and the receive-wal process should figure as a synchronous standby of the PostgreSQL server. IMPORTANT: this is only an example of configuration, to show you that Barman is eligible to be a synchronous standby node. We are not suggesting to use ONLY Barman. You can read “Synchronous Replication” from the PostgreSQL documentation for further information on this topic. The PostgreSQL server needs to be restarted for the configuration to be reloaded. You can define the minimum number of periodic backups for a PostgreSQL server, using the global/per server configuration option called minimum_redundancy, by default set to 0. By setting this value to any number greater than 0, Barman makes sure that at any time you will have at least that number of backups in a server catalog. This will protect you from accidental barman delete operations. IMPORTANT: Make sure that your retention policy settings do not collide with minimum redundancy requirements. Regularly check Barman’s log for messages on this topic. Barman supports retention policies for backups. A backup retention policy is a user-defined policy that determines how long backups and related archive logs (Write Ahead Log segments) need to be retained for recovery procedures. Based on the user’s request, Barman retains the periodic backups required to satisfy the current retention policy and any archived WAL files required for the complete recovery of those backups. Barman users can define a retention policy in terms of backup redundancy (how many periodic backups) or a recovery window (how long). In a redundancy based retention policy, the user determines how many periodic backups to keep. A redundancy-based retention policy is contrasted with retention policies that use a recovery window. A recovery window is one type of Barman backup retention policy, in which the DBA specifies a period of time and Barman ensures retention of backups and/or archived WAL files required for point-in-time recovery to any time during the recovery window. The interval always ends with the current time and extends back in time for the number of days specified by the user. For example, if the retention policy is set for a recovery window of seven days, and the current time is 9:30 AM on Friday, Barman retains the backups required to allow point-in-time recovery back to 9:30 AM on the previous Friday. IMPORTANT: In a temporal dimension, archive logs must be included in the time window of periodic backups. There are two typical use cases here: full or partial point-in-time recovery. Base backups and archive logs share the same retention policy, allowing you to recover at any point in time from the first available backup. Base backup retention policy is wider than that of archive logs, for example allowing users to keep full, weekly backups of the last 6 months, but archive logs for the last 4 weeks (granting to recover at any point in time starting from the last 4 periodic weekly backups). IMPORTANT: Currently, Barman implements only the full point in time recovery scenario, by constraining the wal_retention_policy option to main. IMPORTANT: Currently Barman does not implement manual enforcement. This feature will be available in future versions. These configuration options can be defined both at a global level and a server level, allowing users maximum flexibility on a multi-server environment. By default, retention_policy is empty (no retention enforced). Currently, the only allowed value for wal_retention_policy is the special value main, that maps the retention policy of archive logs to that of base backups. The only difference between these two types of hook scripts is that Barman executes a standard hook script only once, without checking its return code, whereas a retry hook script may be executed more than once, depending on its return code. Specifically, when executing a retry hook script, Barman checks the return code and retries indefinitely until the script returns either SUCCESS (with standard return code 0), or ABORT_CONTINUE (return code 62), or ABORT_STOP (return code 63). Barman treats any other return code as a transient failure to be retried. Users are given more power: a hook script can control its workflow by specifying whether a failure is transient. Also, in case of a ‘pre’ hook script, by returning ABORT_STOP, users can request Barman to interrupt the main operation with a failure. The output generated by any hook script is written in the log file of Barman. NOTE: Currently, ABORT_STOP is ignored by retry ‘post’ hook scripts. In these cases, apart from lodging an additional warning, ABORT_STOP will behave like ABORT_CONTINUE. The script definition is passed to a shell and can return any exit code. Only in case of a retry script, Barman checks the return code (see the hook script section). The script is executed through a shell and can return any exit code. Only in case of a retry script, Barman checks the return code (see the upper section). Barman allows you to specify a directory for lock files through the barman_lock_directory global option. Lock files are used to coordinate concurrent work at global and server level (for example, cron operations, backup operations, access to the WAL archive, and so on.). By default (for backward compatibility reasons), barman_lock_directory is set to barman_home. TIP: Users are encouraged to use a directory in a volatile partition, such as the one dedicated to run-time variable data (e.g. /var/run/barman). As of version 1.6.0, Barman allows users to specify one or more directories where Barman looks for executable files, using the global/server option path_prefix. If a path_prefix is provided, it must contain a list of one or more directories separated by colon. Barman will search inside these directories first, then in those specified by the PATH environment variable. By default the path_prefix option is empty. Barman has been designed for integration with standby servers (with streaming replication or traditional file based log shipping) and high availability tools like repmgr. From an architectural point of view, PostgreSQL must be configured to archive WAL files directly to the Barman server. Barman, thanks to the get-wal framework, can also be used as a WAL hub. For this purpose, you can use the barman-wal-restore script, part of the barman-cli package, with all your standby servers. The replication-status command allows you to get information about any streaming client attached to the managed server, in particular hot standby servers and WAL streamers. By default, Barman uses only one worker for file copy during both backup and recover operations. Starting from version 2.2, it is possible to customize the number of workers that will perform file copy. In this case, the files to be copied will be equally distributed among all parallel workers. where n is the desired number of parallel workers to be used in file copy operations. The default value is 1. Please note that this parallel jobs feature is only available for servers configured through rsync/SSH. For servers configured through streaming protocol, Barman will rely on pg_basebackup which is currently limited to only one worker. The diagnose command output is a full snapshot of the barman server, providing useful information, such as global configuration, SSH version, Python version, rsync version, PostgreSQL clients version, as well as current configuration and status of all servers. The diagnose command is extremely useful for troubleshooting problems, as it gives a global view on the status of your Barman installation. Although Barman is extensively documented, there are a lot of scenarios that are not covered. 2ndQuadrant provides professional support for Barman, including 24/7 service. Barman has been extensively tested and is currently being used in several production environments. However, as any software, Barman is not bug free. WARNING: Be careful when submitting the output of the diagnose command as it might disclose information that are potentially dangerous from a security point of view. Barman is free software, written and maintained by 2ndQuadrant. If you require support on using Barman, or if you need new features, please get in touch with 2ndQuadrant. You can sponsor the development of new features of Barman and PostgreSQL which will be made publicly available as open source. 2ndQuadrant has a team of software engineers, architects, database administrators, system administrators, QA engineers, developers and managers that dedicate their time and expertise to improve Barman’s code. We adopt lean and agile methodologies for software development, and we believe in the devops culture that allowed us to implement rigorous testing procedures through cross-functional collaboration. Every Barman commit is the contribution of multiple individuals, at different stages of the production pipeline. user documentation (tutorial and man pages) is provided. source code is properly documented and contains relevant comments. code supplied is covered by unit tests. no unrelated feature is compromised or broken. source code is rebased on the current master branch. commits and pull requests are limited to a single feature (multi-feature patches are hard to test and review). changes to the user interface are discussed beforehand with 2ndQuadrant. We also require that any contributions provide a copyright assignment and a disclaimer of any work-for-hire ownership claims from the employer of the developer. You can use Github’s pull requests system for this purpose. Barman is the property of 2ndQuadrant Limited and its code is distributed under GNU General Public License 3. Copyright (C) 2011-2017 2ndQuadrant Limited. Barman has been partially funded through 4CaaSt, a research project funded by the European Commission’s Seventh Framework programme. Contributions to Barman are welcome, and will be listed in the AUTHORS file. 2ndQuadrant Limited requires that any contributions provide a copyright assignment and a disclaimer of any work-for-hire ownership claims from the employer of the developer. This lets us make sure that all of the Barman distribution remains free code. Please contact info@2ndQuadrant.com for a copy of the relevant Copyright Assignment Form. It is required by Barman that pg_basebackup and pg_receivexlog of the same version of the PostgreSQL server (or higher) are installed on the same server where Barman resides. The only exception is that PostgreSQL 9.2 users are required to install version 9.2 of pg_basebackup and pg_receivexlog alongside with Barman. TIP: We recommend that the last major, stable version of the PostgreSQL clients (e.g. 9.6) is installed on the Barman server if you plan to use backup and WAL archiving over streaming replication through pg_basebackup and pg_receivexlog, for PostgreSQL 9.3 or higher servers. TIP: For “RPO=0” architectures, it is recommended to have at least one synchronous standby server.